Steve and I recently celebrated our 5 year anniversary of the day we met which for all intents and purposes is the day we started this whole journey of life together... We saw each other every day after that until I went to Texas in 2007. I can't believe its been 5 years and I mean that in a good way! We decided to forgo the usual "recreate our first date" date and just do what we could do... So we decided to go try Fatburger the new place that recently opened in town. Whenever Steve and I try a new place we plan we look at the menu online we talk about what we're gonna order etc... We're foodies what can I say? I'm sure it seems very silly to some people but it adds to the thrill for us! It was wonderful and we're glad we did it. We learned a few things for next time that will save us some money without taking away from the overall experience. Steve wrote this top 10 list about the experience. 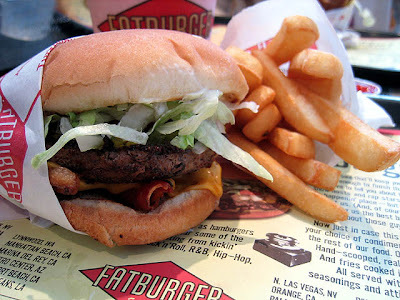 Fatburger... We'll be back... We'll spend less money but we'll leave in less pain! The milkshake was amazing. The memory of that chili still makes my taste buds hum and my only regret about the burger was the relish.